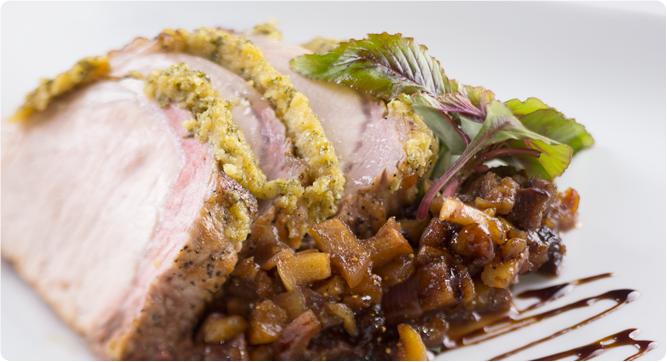 BYU's executive chef, John McDonald—who just won Utah Chef of the Year—is sharing one of his Christmas staples: roast pork tenderloin crusted with maple and mustard, served with apple chutney. Get the recipe. Watch alum Brian Kershisnik answer children's questions about his 7-by-17-foot work, Nativity, now owned by BYU, and get free computer wallpaper of the art. The great Ty Detmer made it to the College Football Hall of Fame. Watch his BYU highlight reel and an ESPN interview, and see Coach Detmer in action now. Revisit Mount Timpanogos and Provo Canyon through the lens of BYU photography professor John Telford, then get free computer wallpaper of one of his shots. BYU defensive end Ezekiel "Ziggy" Ansah had never seen a football before coming to BYU. Now he's a top NFL prospect. See NPR and Sports Illustrated stories on him. Think you know what Christmas looks like around the world? 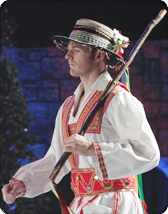 Pair costumes from BYU's Christmas Around the World concert with the countries they represent and be entered in a drawing for a BYU Bookstore gift card.